Deluxe Handheld Shower Massager comes with a tangle free, extra long 84" hose. 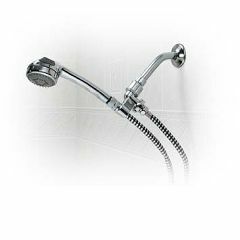 Can be used in handle mount as a traditional shower head. Adjustable massaging head with three spray options. Lightweight. Easy To Install. Sturdy. Functional. Safe. We moved to a new home & the handheld shower head that came with the house, had such a slow water flow it wasn't poweful enough clean my son, who is an adult, with a head injury. This does the job. The length of the hose makes it nice for caregivers too.